[S25] Hannah McPherson, Holcombe Genealogy, Page 217.2. Hiram was enumerated in the 1860 Seward, Winnebago Co., IL, federal census. He was a blacksmith, age 34, born in CT. Also in the household were Alice 11, Mary 9, and Sophia 22, all born in OH. William was enumerated in the 1930 Jacksonville, Duval Co., FL, federal census. He was 68 and not working; rooming with Minnie Bryan. David and Edith were enumerated in the 1920 Brooklyn, Kings Co., NY federal census. Edward Stewart Holcombe II was born on 11 May 1919 at Brooklyn, Kings Co., NY. He was the son of Edward Stewart Holcombe and Elizabeth Mallen.1 Edward Stewart Holcombe II married Nancy May Eggleston. 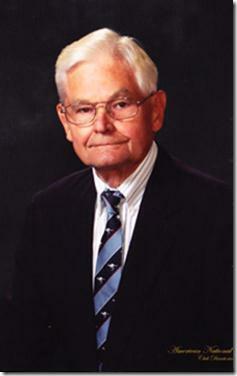 Edward Stewart Holcombe II died on 12 February 2012 at Charleston, Charleston Co., SC, at age 92. Dr. Edward Holcomb, father of a Darien resident, died Sunday, Feb. 12, in Charleston, S.C. He was 92. Dr. Holcomb was born May 11, 1919, in Brooklyn, N.Y. He graduated from Cornell University in 1939 and Cornell Medical School in 1943. During World War II he served as a captain in the U.S. Army Medical Corps, 63rd Field Hospital. In 1947 he married Nancy May Eggleston. They were married for 61 years. Dr. Holcomb moved to Gloversville, N.Y., where he practiced medicine for more than 48 years. He was chief of medicine and chief of staff during his tenure at Nathan Littauer Hospital in Gloversville. volunteer coach with the East of the Cooper Fencing Program. "He was a kind, intelligent, generous man of integrity, wit and wisdom — a true gentleman," his family said. "He will be sorely missed by all who knew him." Dr. Holcomb is survived by his sons, Cary Holcomb of Darien, and his wife Heather; and RIchardHolcomb, and his wife Jacquie, of Christchurch, New Zealand; and grandchildren Taylor and Ben Holcomb of Darien. Oscar succeeded Leland Perrin Holcombe in office upon his death, later entering insurance work. Oscar and Elizabeth were enumerated in the 1920 West Pittson, Luzerne Co., PA federal census. He was a railroad switchman, age 57, she was 56. The only children in the household were Oscah H. Jr. 23, and grandson Kenneth Myers 7. H. Oscar and J. Elizabeth were enumerated in the 1930 West Pittson, Luzerne Co., PA federal census. He was a railroad switchman, age 67, she was 66. Grandson Kenneth Myers 17, and brother-in-law Clarence Clelland 48, were also in the household. Widower Arichibald was enumerated in the 1930 Pittston, Luzerne Co., PA, federal census. He was a dentist, age 62. Son Malcolm 27 was also in the household.